At Robinson we are committed to providing the highest quality of patient care. Our qualified staff is here giving support for the tasks of day-to-day living, allowing for the enjoyment of more pleasant and carefree activities. 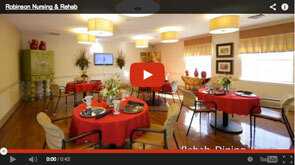 Visit our North Little Rock location or contact us about arranging a stay at Robinson Nursing and Rehab. Building strong relationships with ours residents and their families is key to the healing process.